If you have craze of camping and going for hiking but hate to sleep on the bare land, here is something amazing to enjoy with your sound sleeping and safety. Hammock compatible sleeping bag has been designed especially for those who want to be 100 percent assure with safety and comfort while being away from the home. Although different folding beds and relative products have been launched according to the specific interests, there might be no alternative to Hammock Compatible sleeping bag and its safety as well as comfort features. It is a mash up of hammock and sleeping bag and also easy to fold when not in use. It has been designed specifically to targeted users’ needs and assures that you get a good night sleep no matter what ground is beneath you. It might look expensive among the other cool outdoor gadgets, because its starting price is £112, but after its first time use, you will realize that £112 might be sound investment with many added benefits you received. This hanging compatible sleeping bag is a right choice for sleeping in cold night outside being away from your home. When you sleep in a hammock, most of the bags will compress and may possibly crash the insulting loft and you back will certainly freeze. 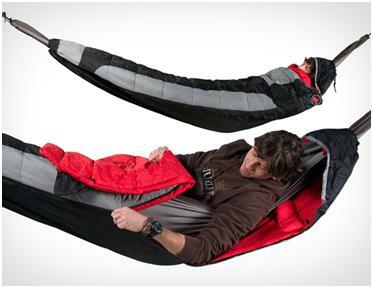 However, Grand Trunk’s Hammock sleeping bag is the compact solution to bring warm sleep for you with its swinging nest. How much pleasure you will feel when sleeping outside during camping in fresh mountain air and feel so good to enjoy the dark night quietness. Science and technology has rightly contributed to bring the products and services for comfort and raising the standard of our living. With new cool gadgets, the world has become a fairy place where everything we wish will be available to us. Some decades before when being outside home, people had great issue to be safe from snakes and other creeping animals, but hammock compatible hanging bag has solved the all tensions and difficulties we had. Now whether it is your own home garden, a mountain peak or being in jungle for some outdoor entertainment, you don’t need to worry about anything to cut or bite you if you have Hammock compatible hanging bag with yourself. The presence of full length zippers will make it easy for an individual to go inside our outside the hammock compatible hanging bag. The total weight of this bag is around 2lbs to 10 Oz. when you plan next time for outdoor camping, don’t forget to bring Hammock compatible sleeping bag with yourself.